Scarred by corruption scandal and huge debt burden, Petróleo Brasileiro S.A. or Petrobras PBR recently unveiled its new five-year plan (2019-2023), which highlights the company’s aim to revive its financial health and boost overall performance. The 2019-2023 business plan of Petrobras is released as Roberto Castello Branco prepares to head the company from Jan 1, 2019, as part of the new Brazilian government led by Jair Bolsonaro. Notably, Branco will replace Ivan Monteiro, who became interim CEO in June after Pedro Parente resigned amid the nationwide trucker strike in Brazil. Per the new five-year plan, the company has raised its investment and divestment targets, which will help to boost growth and credit metrics. 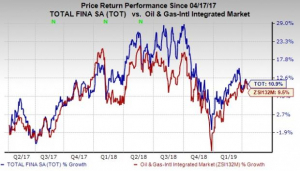 The Brazilian oil giant intends to invest $84.1 billion between 2019 and 2023, representing nearly 13% increase from its projected investment of $74.5 billion through 2018-2022.The prudent capex program, in sync with ambitious production plans, is likely to boost the company’s top-line growth. Notably, more than 80% (or 68.8 billion) of the company’s investment will be targeted toward exploration and production activities. Boasting a lucrative portfolio, particularly in Brazil’s pre-salt reservoirs that lie below the Espírito Santo, Campos and Santos basins in deep and ultra-deep water, Petrobras intends to sharpen its focus on these exploration areas. The company has allocated approximately 56% of its production-related spending for the pre-salt region. Considering Brazil's huge pre-salt oil reserves, estimated at 9.5-14 billion barrels of oil equivalent and widely thought to be the most important oil find in the recent years, Petrobras is in an enviable position to maintain an impressive production growth profile for years to come. Per its ambitious five-year plans, the company intends to boost average production in 2019 to an expected 2.8 million barrels of oil equivalent per day, with 5% average annual growth till 2023. The plan will be supported by the 13 new platforms coming online by 2023. Nearly $13.9 billion is likely to be spent on refining and natural gas, up from $13.2 billion projected in the previous five-year plan. The state-controlled energy firm intends to maximize its position in the refining and petrochemicals market, and establish it as a more competitive and an efficient business. Investments in pipelines, natural gas processing units and RNEST refinery will majorly drive its investment in downstream operations. It intends to optimize its natural gas market and also tap into the profitable renewable energy market with main focus on solar and wind energy, which is the need of the hour. As we know, Petrobras’ involvement in the Operation Carwash scandal has been a major overhang for the company, which significantly impacted its leverage metrics. However, one cannot deny that Petrobras has been making serious efforts to trim its leverage metrics. As of Sep 30, Petrobras had a net debt of nearly $73 billion, decreasing from $84.9 billion at the end of 2017 and $96.4 billion on Dec 31, 2016. Nonetheless, the company’s massive debt load is still a matter of concern. As such, Petrobras now aims to raise $26.9 billion through asset sales to trim its debt load. The company has a target of achieving a net debt to EBITDA ratio of less than 1.5 in 2020 compared with 2.9 as of Sep 30, 2018. Additionally, the company expects its return on invested capital to top 11% in 2020. The company plans to exit non-core businesses like fertilizer plants, its liquefied petroleum gas unit, as well as biodiesel and ethanol businesses, in an effort to streamline portfolio and sharpen its focus on other profitable segments for achieving top-tier results. Petrobras’ committed efforts to improve production, liquidity and operational efficiency, along with ambitious five-year plans make us optimistic about the stock. However, we are a bit discouraged by the fact that the company failed to meet its $21-billion divestment target for 2017-2018 and barely managed to come up with asset sales worth $7.5 billion within the said time frame. With Branco at the helm, it will be interesting to watch if this Zacks Rank #3 (Hold) company can meet its targets this time around. You can see the complete list of today’s Zacks #1 Rank stocks here.